Like other amputees, Priscilla Sutton (pictured) has her sights set on the London Paralympics, but her quest is for artistic glory, not sporting gold. 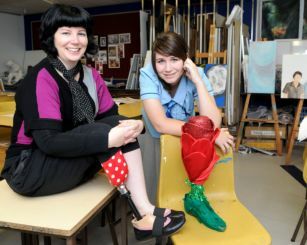 The Brisbane woman who proudly sports a red polka dot leg, curated Spare Parts, an art exhibition of prosthetic limbs last year, in what was believed to be a world first. The exhibition featured more than 40 works, including ABC Spicks and Specks host Adam Hill's donated prosthetic leg, which Patience Hodgson from Brisbane band The Grates transformed. Sutton, 31, says she's now "stalking" inspiring Paralympians and well-known international amputees for prosthetic limb donations to be used as art canvases ahead of next year's London Games. "Beware Paralympians, I want your limbs," she says, giggling. On her wish list is Oscar Pistorius, a South African double amputee world record holder, known as the Blade Runner - the fastest man on no legs, Sutton says. "He wanted to race in the Beijing Olympics and was told no because he's at an advantage... Cheetah legs have a bounce, because they're made out of carbon fibre,," she said. "They did scientific research and discovered that he wasn't at an advantage... because amputees use more energy to walk and to run." "They decided it evens out and he was allowed to try out for the Olympics but missed out by point-zero-something-crazy of a second and he's been training like crazy and is allowed to try out for the London Olympics. "His goal is the Olympics and Paralympics, which for me is so inspirational - he'll be the first to do that as a runner." She will also seek a leg donation from Heather Mills, ex-wife of former Beatle Paul McCartney. Sutton also hopes to involve London bombing survivor, Australian Gill Hicks, who lost both her legs in the terrorist attack, as well as American athlete Aimee Mullins. Sutton says the Paralympics exhibition will be interactive and showcase both Australian and UK artists, with donated prostheticlimbs from all over the world. Her ambitious plan to take Spare Parts to London will cost an estimated three times more than the Brisbane event and Sutton is seeking sponsorship. Sutton says the limbs will be up for sale at the end of the London exhibition. Some of the crowd favourites from the Brisbane show are going to London. Spare Parts will be at the Rag Factory London for the 2012 Paralympics.